Atomic Aquatics Venom Mask is a blending of Atomics SubFrame and Frameless Masks. It has a reinforcing internal frame that's molded directly beneath the surface of the silicone rubber skirt, like on the Subframe, yet it offers the relatively low profile of the Frameless. A single window like the Atomic Frameless, but it has a high bridge and tear-drop shape similar to the SubFrame's dual-window design. Its easy-to-use squeeze-to-adjust buckles are soft-mounted to the mask skirt, which allows flexibility in strap positioning, plus they can be folded flat for packing. Where the Venom differs from its SubFrame and Frameless cousins is in its lens construction. While the SubFrame and Frameless lenses use Ultraclear glass, which has a reputation for optical quality in its own right, on the Venom mask Atomic uses an even higher-quality glass imported from Germany. Called Schott Superwhite glass, it allows more light to penetrate than even Ultraclear glass. In addition the Venum ARC Mask has an Anti-Reflective Coating which allows more light to enter the mask and reduce light reflection. This makes seeing through the mask better above and below the water. Atomic Aquatics developed ARC (Anti-Reflective Coating) Technology to Reduce Reflected Light and actually Increase the amount of Available Light Transmitted to a Diver's Eyes. Theresult is a greatly Improved Transmission of 98% of Available Light, compared to a loss of more than 14% of light with standard green "float" glass used on the majority of masks on the market. Anti-Reflective Coatings or ARC" is a Multi-Layer Metal Oxide Coating Process applied to both sides of the Ultra-Clear Lenses. 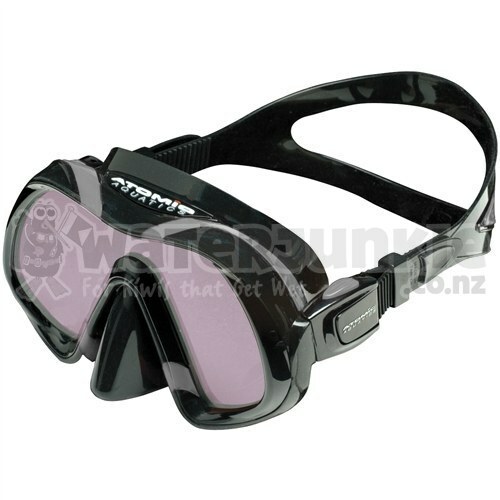 This allows more light to enter the mask by Reducing Light Reflections off the inside and outside surface of the lens. The Metal Oxide Coating is only a few Microns Thick.ARC will give you Clearer, Crisper Vision. You will see more Clearly Underwater and Objects in the Distance will become more Defined and Acute. ARC also Increases Contrast and Clarity, Reduces Eyestrain, Glare, and prevents Ghost Images on the Viewing Area of the Lens. ARC is an Absolute Must for Night Diving, Limited Visibility Conditions, and Underwater Photographers. As with all Atomic Aquatic Masks the Venom has a double feathered edge silicone rubber skirt with a wide split strap design, which in combination, afford an excellent fit and seal on the face. A one-handed nose well for easy ear equalization brings the lens of the mask closer to the diver's face further increasing the field of vision. The Venom comes with a mask box has a limited lifetime warranty on the frame and a 12 month limited warranty on the buckles and mask skirt.